Haflinger horses originate from the Southern Tyrolean Mountains of Austria. They were first bred in Hafling, Austria, which has since become a part of Italy. Many places in the Tyrol Mountains were only accessible by narrow paths which required agile and surefooted horses. 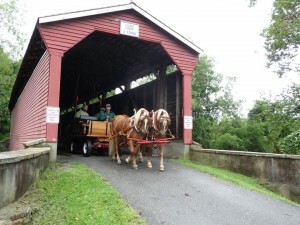 Thus the Haflinger was used in this area for transportation and packing. The first documentation of the present day Haflinger was in 1874, a stallion named 249 Folie. This horse was the offspring of a half-Arab stallion and a refined native Tyrolean mare. All purebred Haflingers trace their ancestry back to 249 Folie through seven different stallion lines: A, B, M, N, S, ST and W. Haflinger horses were first introduced to the United States in 1958 by Tempel Smith of Tempel Farms, Illinois. Haflinger horses have been used to work on the family farm pulling a plow, hauling heavy loads or as a means of transportation. 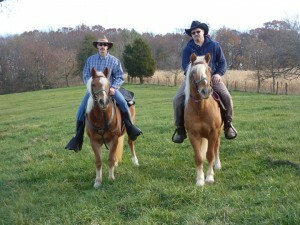 Today the Haflinger can be found practicing dressage, jumping, packing, pleasure driving, trail riding and draft work. If you are interested in looking for the ideal Haflinger, the breed standard may help you to understand what to look for in the horse. Most Haflingers range from 13 hands (52 inches) to 15 hands (59 inches) in height and weigh 800 to 1300 pounds. To describe their frame, most Haflingers have a strong arched neck, a broad head that is flat or slightly dished shaped, a broad chest and rump, strong tapered legs and large hooves. They can vary in chestnut color ranging from light blonde to dark chocolate. Some Haflingers may also have dappling or light spots on their coats. Their manes and tails can be very full and range in shades of white to flaxen. Breeding stallions should have masculine features and brood mares should have feminine lines and features. In naming a Haflinger, owners typically name the colt with the same beginning letter as their sire and fillies’ names have the same beginning letter as their dam. For example our mare, Dixie Laurel, had a filly so we named her Dolly. Our mare also had a colt whose father’s name was All American Boy and we named him All American Alpie. All of our Haflingers at Bryan Hill Farm are registered through this official registry. AHR was created in 1998 and includes over 98% of the Haflinger owners in North America and over 15,000 Haflingers. The AHR assists to provide accurate documentation of Haflinger pedigrees and history of ownership records. For more information about the AHR, please visit their web site. © 2005 - 2019 Bryan Hill Farm & Mountain View Product Marketing, Inc. All rights reserved.